Life isn’t easy for anyone trying to assert themselves in the world. It’s particularly difficult for those gifted few who find themselves thrust to the margins of society by virtue of who they are. The realities of this are explored on a heroic level in that unique mix of superhero drama and weird science that is The Unstoppable Wasp. Writer Jeremy Whitley thoughtfully fuses genres in an endearingly unique chapter in the lives of the latest incarnation of The Wasp and her friends at Genius In action Research Labs. Alti Firmansyah handles the art. Espen Grundetjern brings color to the page. As the issue opens, current Wasp Nadia is desperately trying to apologize for her scattered behavior in the recent past. Suffering from bipolar disorder is one thing...suffering from bipolar disorder while possessing a crazy brilliant intellect and the ability to shrink down to a microscopic level is that much more exasperating for everyone in her life. Meanwhile, a deadly assassin girl named Ying is going to Hollywood to a first-time meeting with the film actress mother of her super-genius girlfriend Lashayla. All this and the dangers of psychically talking with plants in another enjoyable excursion with the young savants of G.I.R.L. It’s a group of girls who are all overcoming different challenges to assert themselves in a very, very difficult world. The surface of the premise runs the risk of feeling acutely “After School Special”-y. It’s got a cringingly high face value. There’s no question that they’re trying to be inspirational to a hopefully female target audience, but Whitley does such an excellent job of fusing the weird science/Marvel saga/coming-of-age girls school genres together that the painfully obvious nature of the premise doesn’t inspire a single wince. 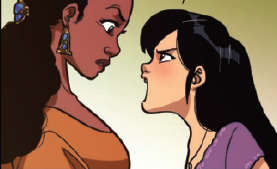 If anything, the meeting between Ying, Lashayla and her mother at issue’s end is enough to bring a tear to the eye. Whitley has a really keen understanding of what makes characters emotionally engaging. Firmansyah’s art delivers emotion with a playful manga-esque semi-exaggeration of emotion that serves the comedic ensemble drama well. Detail and anatomy are flexibly applied in a style that makes use of slightly enlarged expressive eyes and tenderly amplified facial expressions. It’s a remarkably engrossing emotional rendering of an ensemble that steers clear of ridiculous exaggeration that so often plagues manga-inspired art. Grundetjern’s color moves right along with the art casting shadows and shades more or less exactly where they need to be without clashing against Firmansyah’s work. It’s always going to be a bit difficult to find the right market for a comic book like this. A STEM-stressing social ensemble serial that is so obviously pointed at girls can feel like it’s reaching a bit too far to try to reach its target demographic. Thankfully Whitley and company are diligently piecing together a product that holds an appeal beyond its target demo. There’s nothing quite like this on the comic book rack right now. Hopefully, it can continue to find its audience as the series progresses.